Pericarditis is the inflammation of the pericardium, or sac-like membrane that envelopes the heart. 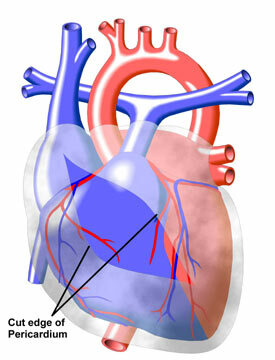 The pericardium cushions, anchors, and protects the heart muscle. The inflammation may be caused by bacterial infection, radiation therapy, the side effects of certain medications, kidney failure, tuberculosis, auto-immune disorders (such as lupus or rheumatoid arthritis), or certain forms of cancer. It may also develop after a heart attack. In cases where the cause of inflammation cannot be determined, it is termed idiopathic pericarditis.